FIVE people were injured after an explosion rocked flats in the heart of Batley. The blast is believed to have occurred in a building on Hick Lane, just to the rear of the two-storey former HSBC premises housing a small number of flats. Residents heard an enormous explosion just after 6.45pm on Wednesday evening. 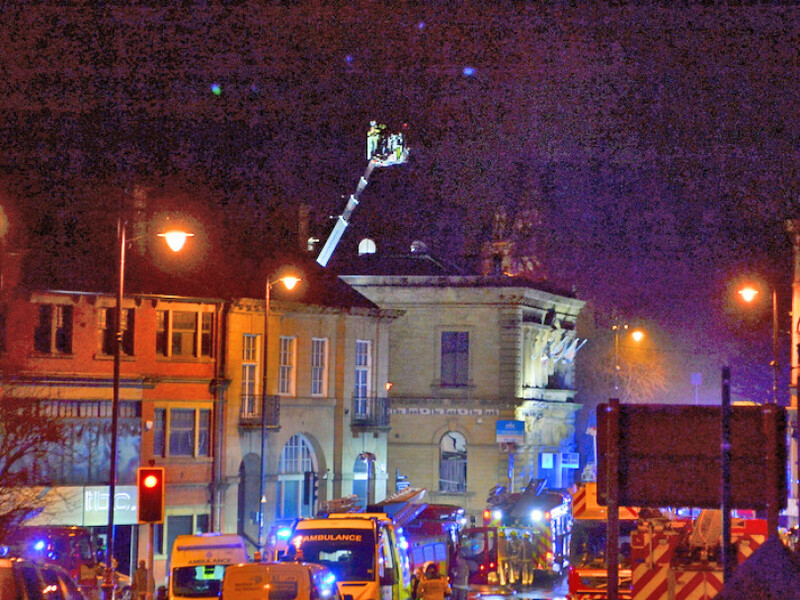 Ten fire engines were initially called to the scene and dozens of emergency crews stayed overnight with concerns over the structural stability of the old bank building, which was also in use as a nightclub for several years. Five men aged between 35 and 39 suffered burn injuries and remain in Pinderfields Hospital. The incident is not believed to be terror-related. Officials initially said that it was a suspected gas explosion but they are now treating it as ‘unexplained’. Crime scene investigators were seen bringing out bags of evidence yesterday (Thurs). The Royal Logistic Corps Explosive Ordnance Disposal team – the ‘bomb squad’ – was called in as a precautionary measure to ensure the safety of the property and the houses in the surrounding area. One witness said he saw people covered in blood fleeing from the building, while some nearby residents were evacuated from their homes. Smoke was seen billowing across Batley but the fire was extinguished later in the evening. Bradford Road – the main route into Batley town centre – at its junction with Hick Lane was closed throughout the night and most of yesterday. A witness, who did not want to be named, described the blast as “like a war scene”. Watch commander at Dewsbury Fire Station, Mark Hemingway, confirmed fire crews were back on the scene at 8am yesterday morning to relieve the crews that stayed overnight. The road closures meant that the nearby Mill Outlet had to close for the first time in over 20 years. Batley & Spen MP Tracy Brabin tweeted her thanks to the emergency services for their efforts. She said: “Thank you so much for all you do. When others run from harm, you run to protect and rescue others. Thank you from #batleyandspen”. Police used a drone yesterday to survey the building. Detective Superintendent Pat Twiggs, said: “Police and partner agencies have worked throughout the night to ensure the scene is safe and there is no safety risk to members of the public.